Cliff Richard? Never heard of him. Oasis have been accused of nicking, borrowing - you know, ripping off - a bit of Sir Cliff Richard's 1976 hit Devil Woman on their new song The Turning. Noel, Liam Gallagher and company posted the song on their MySpace page last week ahead of Dig Out Your Soul's release today (Oct. 6), and almost immediately, Cliff Richard fans began wriitng on the singer's website about what they say is an uncanny resemblance. One user by the name of Rolybunny says, "This is a rip-off. What'll they do next? Remix Mistletoe and Wine?" On the other hand, some Richard fans are elated, viewing the similarities as something of an honor for the aging pop star. 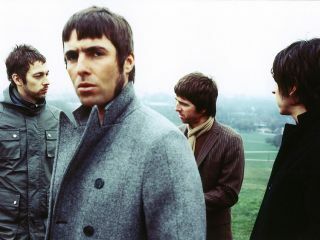 Janine Castle, from the International Cliff Richard Movement, says, "I'm astounded Oasis use Cliff as their muse - but delighted. I can hear the similarities. It's about time Cliff's musical genius got some recognition." Even so, MusicRadar can't really get on the Cliff Richard train. True, the opening chords of The Turning are of a similar structure to those used in Devil Woman. But that's as far as it goes. The melody and chorus hook - not even close. Check them out for yourself. Here's Cliff Richard's Devil Woman, and here's Oasis's The Turning. We think a clearer case can be made for these two songs: Oasis's Step Out, released as a b-side on Don't Look Back In Anger, and Stevie Wonder's '60s smash Uptight (Everything's Alright). In fact, Wonder wound up getting songwriting credit on the Oasis cut. Not a bad way to make a buck. Read more on Noel Gallagher's 'crafty' songwriting.